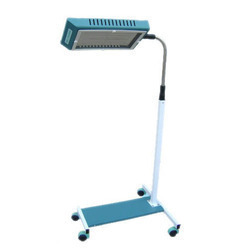 Pioneers in the industry, we offer led double surface photo therapy, led single surface photo therapy with trolley and led double surface phototherapy from India. Our team of experts enables us to provide our clients premium quality assortment of Radiant Warmer with Double Surface Phototherapy. Our complete product range is procured from the reliable vendors of the industry. These products are innovatively designed for use in Nursery, Labour & Delivery suits to provide quick & effective treatment for the newborn infants, who suffer extreme of heat loss. Offered products are provided with advance microprocessor based controller is loaded with a full spectrum of unique features to support the needs of your most special patient. Sturdy mobile crib mounted on castors can be used along with warmer stand, wall mounted warmer, phototherapy stand & as a separate bed for neonates. UPPER SURFACE UNITFour, Imported Compact Flourescent Lamp (CFL) emitting Blue radiation with a peak at 450 nm specially used for hyperbilirubinaemia treatment (18W/71).Two, CFL Daylight Tubes.Heavy duty mobile stand with height adjustment facility easy Swivelling box when stand is to be used in conjunction with Radiant Warmer.Mirror finished reflector.M.S. Fabrication with powder coated paint.Source cooling Fan.Safety Grill.Time Totaliser (Optional).UNDER SURFACE UNITFour, Imported Compact Flourescent Lamp (CFL) emitting Blue radiation with a peak at 450 nm specially used for hyperbilirubinaemia treatment (18W/71).Two, CFL Daylight Tubes.Mirror finished reflector.M.S. Fabrication with powder coated paint.Source cooling Fan.Safety Grill.Detachable source unit can be used along with Radiant Warmer and Infant Trolley.INFANT CARE TROLLYEasy access of Infant from all sides with thick Acrylic collapsible side panels.Acrylic baby tray with Infant's Head up / down facility foam mattress.Provision for positioning X-ray cassette.S.S. 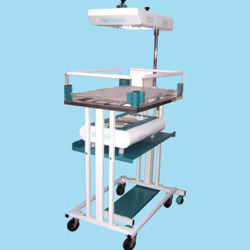 Tray with slot to use Undersurface Phototherapy.I.V. Pole facility.One lower Shelf.M.S. Fabrication with powder coated paint.Mounted on castors for easy mobility. Looking for Phototherapy Machine ?